After eight extremely busy weeks I was more than worn out. I truly felt like my wings had been clipped and that climbing the sky wasn’t going to happen again for me at least for a while. Luckily I had scheduled my spring fasting ceremony to begin last Wednesday (May 6th). What an amazingly spiritually enriching time I had among the trees. I now feel refreshed and reinvigorated. I recommend fasting for all who search to find their purpose as a human being. Be it ever so humble, there is no place like the soul. My experiences at the fasting site were many but one in particular jumped out at me. As I was sitting in my forest circle, I saw all around me the leaves fallen from the trees last autumn. They lay on the forest floor, rust-coloured and brittle, maple leaves, oak leaves, yellow birch and elm leaves. Their tips clutching those of the leaves around them. In life, they had sung their own unique songs. The tree unto which they were attached proudly displayed them for all to see. The leaves waved to their neighbours day and night. All was well. Now in death, they lay side by side, returning to the earth that gave them life. The brush of the wind brings forth a song from them. Together at last, in a hauntingly beautiful symphony. I meditated on this for a long time. And after I did so, I lit my pipe and smoked a bowl full of sacred tobacco in thanksgiving of another teaching being added to my bundle. 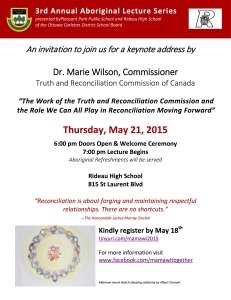 Now that I’m back, I want to share with you that TRC Commissioner Dr. Marie Wilson will be at Rideau High School, 815 St. Laurent Blvd. in Ottawa, on May 21st. Please click here to read and share the flyer. As an activist and as a human being, I am requesting your presence at this event. 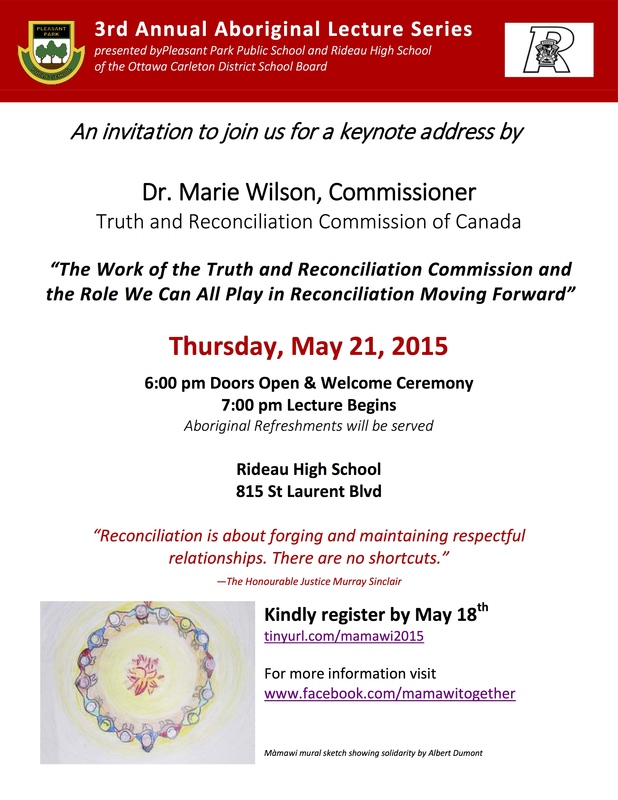 Dr. Marie Wilson will make an hour-long presentation about TRC. The coordinators of the event need you to be there. Please show your support. Wawatay Catering will be there. There is no charge. All are welcome. This entry was posted in Community, Idle No More, Spirituality and tagged Aboriginal, Canada, ceremony, fasting, Marie Wilson, Ottawa, Rideau High School, sacred, tobacco, TRC, Truth and Reconciliation Commission, Wawatay Catering. Bookmark the permalink.